If you're looking for a sewing tutorial, look no further than Sew Can She, Caroline's brilliant website which has links to just about every free tutorial under the sun. Caroline is a talented pattern writer herself and is the co-author of Just for You, a wonderful book full of clothing and accessory projects. 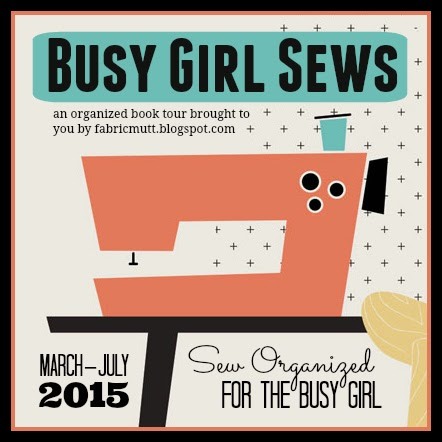 I have loved following her blog over the years and am delighted to have her on the Busy Girl Sews Tour this week. She's sharing her own organizational progress report as well as the adorable caterpillar pillow you see above. Stop by her blog to read more! Next week I'll be wrapping up the book tour with a look at my new sewing room here in Texas and how I'm working to get myself organized again after our move. It's all in progress now, and I can't wait to share the (hopefully!) finished product with you next Monday! Back in 2012, I was partnered up with Jess of Quilty Habit for the Modernista Swap, and it was the start of a beautiful friendship. She was (and still is) crazy about all things Anna Maria Horner, so I made her the mini quilt and basket you see above, featuring AMH prints and a block from Elizabeth Hartman's Modern Patchwork book. It was hard to let go of my Perspective quilt, but thankfully Jess lets me get a peek at it on Instagram once in a while when she shares a shot of all the cute mini quilts on her sewing room wall! She is such a talented quilter, and her enthusiasm is always an inspiration to me. Today you must head over to her blog to see the Flutter quilt she made, which was inspired by a beautiful Design Seeds color board. I love this little butterfly baby quilt, and Jess's version couldn't be sweeter. Go take a look! 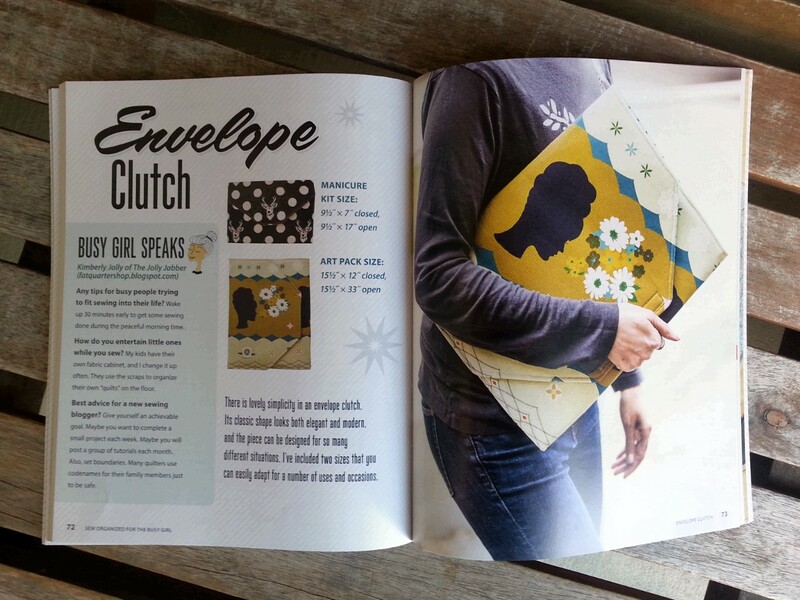 While I am spending my first night in our new home in Texas, my dear friend Beth from Plum & June is carrying on the Busy Girl Sews book tour this week. Beth and I have known each other since we both started blogging, and I was so happy to have her be a part of my book. She created the Advice for New Bloggers Blog Hop, which has helped so many new sewing bloggers over the past few years including me. She also recently co-wrote The Modern Medallion Workbook with Janice Zeller Ryan, an inspiring book full of beautiful medallion quilt patterns. Stop by her blog to see Beth's start on a Dotty Hexagon Pillow using stunning little scraps of Liberty fabric! It was almost five years ago that our family first started talking about the idea of moving out of California to somewhere a bit less expensive and crowded. We weren't quite sure where exactly -- perhaps Texas -- but it wasn't really much more than talk back then. There were so many factors that made it impossible to consider a move at the time, and while we enjoyed dreaming about the possibilities, there wasn't anything we could do about it. Maybe that's why I can hardly believe that this Saturday morning, we'll be piling everyone into two cars and heading down the 10 freeway toward San Antonio and our new home. I know people who have moved three, four, even a dozen times in their lives, but for me this is all brand new. The truth is that I never thought I would leave California. When we moved from the little town of Sierra Madre to purchase a home with my parents in Rancho Cucamonga seven years ago, I thought that would be the one big move of our lives. I'd only been married for two years and my oldest daughter was barely walking. I had no idea what kind of lessons were coming my way in the years to come. We've been slowly packing up this house for the past six months, and it feels like an eternity, the longest goodbye I've ever said. Over the last month we've checked off all the things we wanted to do before leaving: a last trip to the beach, visits to our favorite ice cream shop, dinner at the Japanese restaurant that my husband adores. James even took me back to my home town so that I could walk one more time past the house where I grew up in which five generations of my mother's family lived. On the way, I got to say farewell to old friends like the owner of the grocery store where I got my first job at 17 and the family who owns the Mexican restaurant where my parents used to take us for dinner every Friday night back when I was in junior high. It's amazing how important a part such people can play in the story of our lives. There have been other partings, harder ones, with dear friends and family who have touched my heart with love and encouragement when I needed it desperately. You can't replace these kinds of people. It's just a matter of leaving little pieces of your heart with them as you go. Tonight I sit on the floor in the empty upstairs loft while my family is sleeping, and I'm flooded with memories. This is the room where I was up all night for a good three years, feeding babies and watching Jane Austen movies on my computer at 3 in the morning. It's the room where my mom taught me how to use a sewing machine and where the guys talked and laughed in the evenings before bed. It's where Mom and I met in the middle of the night when we couldn't sleep, and I can't tell you how many times we wept and prayed together over sick children, my grandmother's dementia, our fears that we wouldn't be able to keep up with the mortgage payments. Somehow sharing the burdens made them easier to carry, and I always went back to bed thankful that I wasn't facing these things alone. Looking back now, I realize that this is the house where I really grew up. I've learned so much within these walls about life and perseverance and yes, even myself. I'm so thankful for these experiences -- even the hard ones -- that made me who I am today and taught me to remember what's most important. For today's stop on the Busy Girl Sews Tour, head over to Bryan House Quilts where Becca will show you her sweet summer version of the Envelope Clutch Art Pack. Becca and I have been friends since I first started blogging, and she's a constant source of encouragement and inspiration for me. 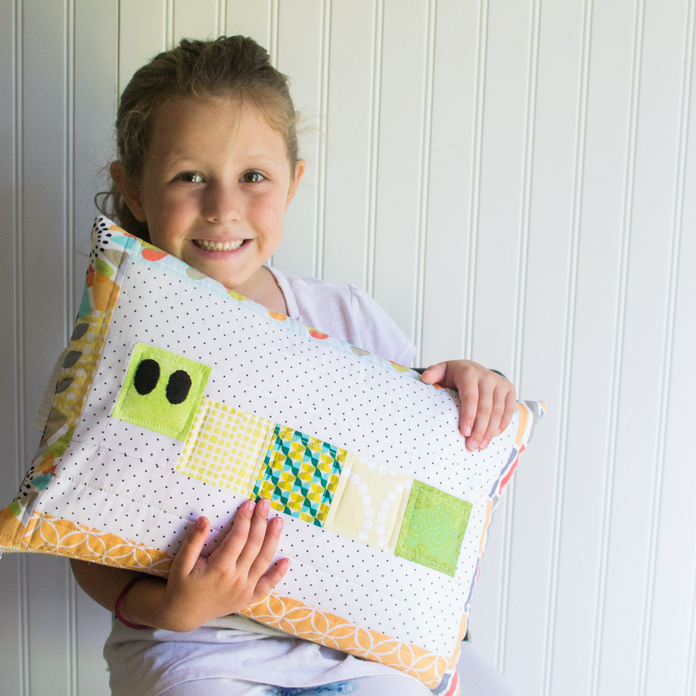 She sells her own quilt patterns, has written the gorgeous book Modern Rainbow, and is a new project designer for Sizzix -- this girl does it all! She has some great organization tips on her blog today too, so be sure to check it out!